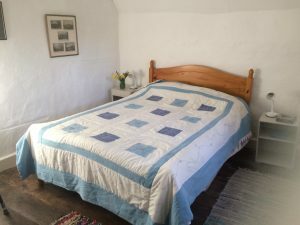 The simple cottage attached to the Meeting House is now available for Friends and visitors to stay in. The approach to Dolobran Cottage is through a small woodland path. 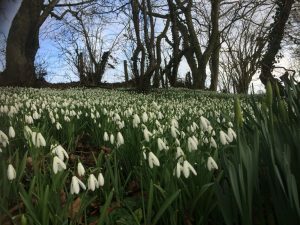 In Spring, these woods are covered in thousands of snowdrops, later followed by daffodils, primroses and finally bluebells. 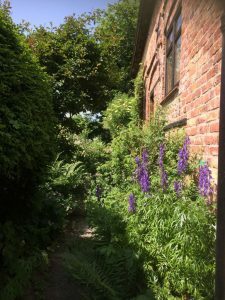 The cottage and the Meeting House are in a little sunny hollow facing due south completely surrounded by fields and woods. 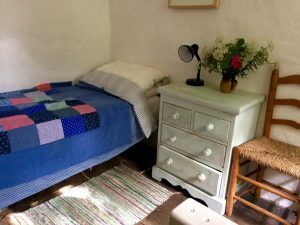 The cottage consists of a double bedroom, a single bedroom, a sitting room with an open fire, a small kitchen and an outside toilet and shower. There are no made up roads within three quarters of a mile. A registered footpath, Owain Glyndwr’s Way, passes the wood by the Meeting House. The garden has a lawn with a bench and table that seats six for outside BBQ’s. The flower beds are filled with roses and shrubs and flowering trees. 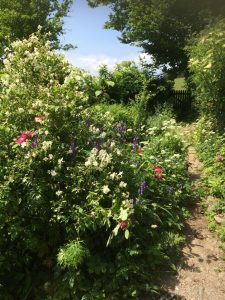 As a charity we rely on donations of £30 a day for stays at the cottage, to help towards the yearly upkeep of the Meeting House. My brief sojourn in the cottage has helped to recharge my batteries and I feel refreshed. I have enjoyed browsing through information on the bookshelf about Quakerism and the local area. 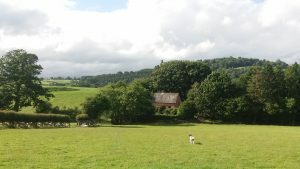 My dog Lucy and I explored small stretches of the Glyndŵrs Way which was lovely. Joining in the meeting for worship on Sunday was a joy. My thanks go to Sophie and Simon for their friendliness and warm hospitality. Jennifer Baker. 29th Sept- 2nd Oct, 2017. What a magical place! We were expecting rural remoteness, but were still taken aback by the sheer peaceful beauty of Dolobran. The tranquil atmosphere in the Meeting House itself has to be experienced to be believed. 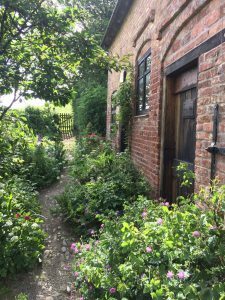 The gorgeous little garden created sympathetically from the surrounding countryside, and finally the comfortable simplicity of the cottage itself- what a privilege to have stayed in such a special place, where history makes itself felt ever so gently. We return to Bristol refreshed and renewed and know that we definitely want to keep coming back! Thank you to everyone at Dolobran Meeting for generously sharing what you have with others, in particular to Sophie and Simon for making us so welcome. We loved meeting you, and look forward to planning our next stay to span a Sunday. Jenny and John Griffin. 18th- 22nd Sept, 2017. Such Kindness and peace here. Always a welcome. The place is special to me and I hope will be special to others. I stayed 10 days, all were wonderful. John Crook. In the sky’s above our crowded isle, the Milky Way tends to remain at arms length, known but unseen. So to see this starry phenomenon on my arrival at Dolobran Meeting house on a clear night in late August… well, I looked in awe until my neck ached. 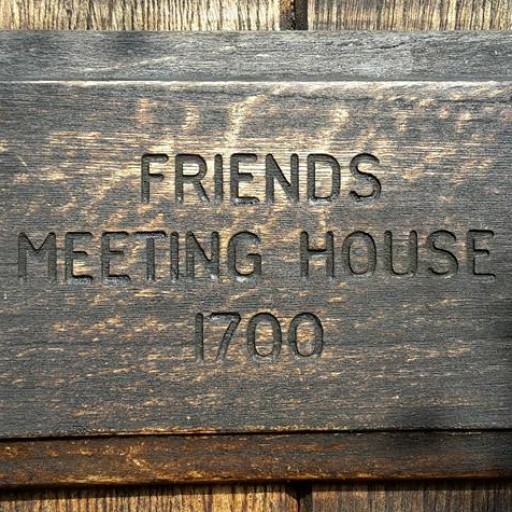 The Meeting House is 3/4 of a mile from the nearest road, which takes some beating unless perhaps you’re on first name terms with a Scottish laird. 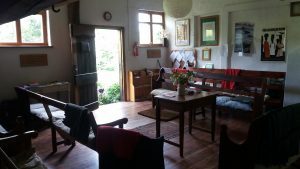 The facilities too, match the gentle seclusion, providing ones basic needs but no more, a true reflection of the Quaker belief in living life simply. 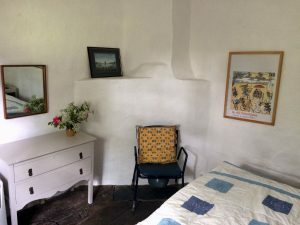 You’ll find a comfortable bed, an open fire, and a well stocked galley kitchen in which to cook and wash. Perhaps the hardest choice for any visitor is which mug to choose from the many provided, a loverly reminder of how active this Meeting House remains. More than anything, I will remember the welcome I received from those I met at Dolobran, especially the unwavering warmth and enthusiasm of Sophie and Bron. 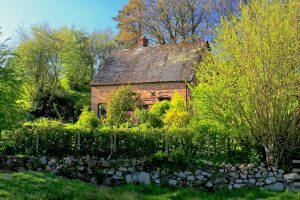 So for those who wish for quiet reflection, try this wonderful Island sanctuary beneath the heavens in unspoilt Powys. It truly does the power of good. Thank you. Stephen Tate. 30th Aug- 17th Sept, 2017. Not the warmest of Augusts, but a very warm welcome here at Dolobran, both to the cottage and the meeting. It is so lovely to be somewhere away from the noise of traffic! The peace and simplicity and the beautiful greenness is a joy to experience. We walked one day to Pont Robert and one day to Meifod. We had two touring days, one around Welshpool and Oswestry Iron age fort and Llanrhaedr Waterfall, the other to Lake Vyrnwy. Many thanks to Sophie who supplied things we hadn’t realised we needed, as well as decorating our rooms with flowers. Thank you Sophie to your attention to detail to enable our stay here to be so enjoyable. I loved it here. Peace, peace, peace. What a wonderful respite. P.S. 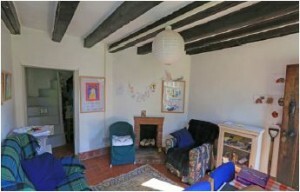 All visitors after us will enjoy the super shower, but we can recommend the pleasure of bathing in front of the fire. Christine and Yvonne. 3rd-8th Aug, 2017. 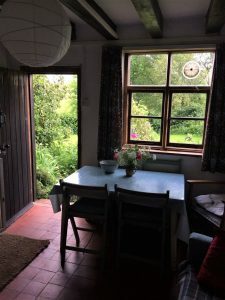 We had a lovely time, eating and washing outdoors itself was a great experience for Ben and Will, walks, outings, cosy by the fire in the evening and we also slept very peacefully in this quiet and beautiful place. Ben, Will, Marlen and Richard. 23rd-26th July, 2017. What a lovely welcome we have had from all at meeting, just what we needed, days of silence plus Sunday Meeting. We plan to return again with some family. Imogen and Dougal. 1st- 5th July, 2017.